It would be brilliant if environmental intelligence simply rose in the minds of all humans, but that isn’t the case. It takes dedicated and committed individuals to expand educational programs that can be absorbed by a broad swath of the population. And it takes funding … of select programs, of staff, of equipment … to facilitate change. 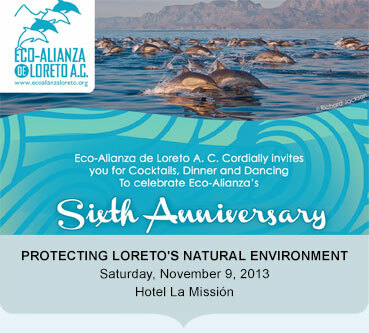 Eco-Alianza of Loreto celebrates its 6th Anniversary this week – 6 years of dedication to protecting Loreto’s natural environment. To commemorate the occasion, the organization is hosting a fundraiser – a night of cocktails, dinner created by La Mision’s Master Chef, live and silent auctions, a raffle, and dancing – at the Hotel Mision in Loreto, Saturday, the 9th of November, starting at 5:30pm. The funds raised by this event benefit the Environmental Education Programs for Loreto youth. The evening is made possible by the generous donation of Scott Serven, owner of La Mision, and is the second annual event. Tickets are on sale for $27.00 and may be ordered online at Eco-Alianza’s website — http://www.ecoalianzaloreto.org – or with Edna Peralta at Eco-Alianza’s headquarters, the Community Center for the Environment on Miguel Hidalgo in downtown Loreto. This will be a great and fun event, and benefit not only the youth, but the entire community of Loreto.